San Diego natives and entrepreneurs William and Anne Evans founded Evans Hotels in 1953 and the company has been a part of the fabric of America’s Finest City ever since, with two properties on Mission Bay and one in the prominent seaside community of La Jolla. 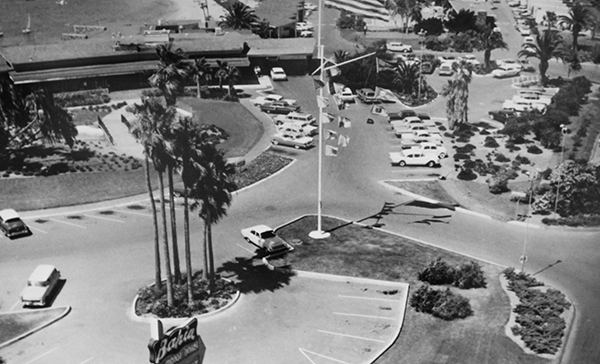 The Bahia Resort Hotel was the first commercial lessee on Mission Bay, opening in early 1953 with 52 rooms after the City of San Diego offered several parcels of land for commercial development. 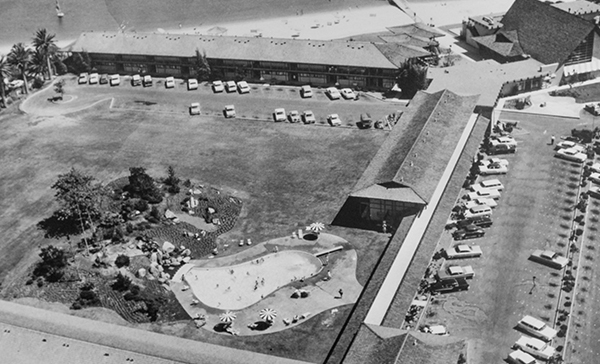 The Evans family then acquired the right to develop land at the northwest corner of Mission Bay in 1958 for the Catamaran Resort Hotel and Spa. In April 2002 the Evans family opened the doors to The Lodge at Torrey Pines, a AAA Five Diamond resort that blends seamlessly into La Jolla’s Torrey Pines State Reserve and Torrey Pines Golf Course. To accomplish this goal, the City offered several parcels up for bid, in the hope that various hotel, marina, theme park, and concession operators would jump at the opportunity to be the first to build on a new Mission Bay. But, in the early 1950’s, City budget-makers wondered who would step forward and take the risk. In the midst of the Bahia’s gradual growth (helped by the hotel’s tremendous popularity with travelers), the couple built the Catamaran Resort Hotel, a Polynesian-themed hotel on a private leasehold at the northwest corner of Mission Bay. Upon its completion in 1959, the Catamaran was added to the family of Evans Hotels. Initially an 82-room inn, expansion of the hotel began in 1968 with the construction of the 13-story, 160-guestroom tower. Between 1986 and 1988, the resort was completely renovated and expanded to its current 311 rooms. To make transportation between the two hotels more convenient for guests, Mr. Evans made an innovative addition by purchasing a 45-foot ferry and reconstructing it as an authentic Mississippi-style sternwheeler, the Bahia Belle, in 1961. Rebuilt in 1981 to increase its guest capacity to 200 passengers, the Bahia Belle continues to shuttle between the two resorts on Mission Bay to this day. Following the death of William D. Evans in 1984, Anne Evans became more active in the business and added the two oldest of her five children, Grace Evans Cherashore and William (Bill) L. Evans, to the company’s management team. Their first project, a second sternwheeler, was named the William D. Evans in honor of the pioneering spirit of the company’s founder. Custom-designed and built in San Diego, the William D. Evans was launched into Mission Bay in 1986. The beautifully crafted 99-foot ship can accommodate up to 600 passengers. Under the current management team, the company has experienced a period of remarkable growth over the past two decades. Both the Catamaran and Bahia saw extensive improvements, while a new hotel, The Lodge at Torrey Pines, was purchased in 1995. Located on City-owned land in La Jolla, one of the most picturesque resort towns on the Southern California Coast, the hotel overlooks the Pacific Ocean and is immediately adjacent to the 18th green of the Torrey Pines Golf Course (site of the 2008 and 2021 U.S. Open Championships) while the Torrey Pines State Reserve, with its beaches, golden cliffs, and rare pine forests, is a short walk away. Once a small 74-room inn on land leased from the City, the Evans Family entirely reconstructed the hotel between 2000 and 2002, turning it into a 170-room luxury resort. Modeled after the Gamble and Blacker houses in Pasadena, California, two of the best examples of early 1900’s Craftsman-style architecture, The Lodge has been awarded a AAA Five-Diamond ranking every year since it reopened. Ever the pioneer, Evans Hotels considers its role in the economy of San Diego to be an important part of the region’s future, employing almost 1,500 San Diegans. Today much of the success of the City’s tourism industry can be traced back to that mudflat in Mission Bay where two young hoteliers saw the future. Now Anne Evans and her adult children, Bill Evans and Grace Evans Cherashore, continue to lead one of Southern California’s true success stories in tourism entrepreneurship and its hopes for continued success in the future.